1. 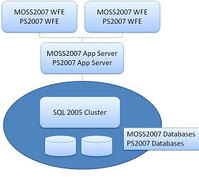 Migrate Project Server 2007 to a Windows SharePoint Services 3.0 Farm. 2. Migrate Project Server 2007 to Microsoft Office SharePoint Server 2007. 3. Install a new Instance of Project Server 2007 on Windows SharePoint Services 3.0. 4. Install a new Instance of Project Server 2007 on Microsoft Office SharePoint Server 2007. 5. 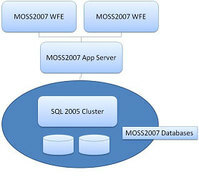 Migrate a Project Server 2007 Database from Test to Production Farms. The most important concept to remember is that Project Server is only a component on a SharePoint Farm, so when you migrate a Project Server you are installing new services on your SharePoint environment. With this in mind, it is easier to understand how to distribute the services on the new environment because the existing services will continue to work the same way they did before. In this article, we will provide some guidelines on how to proceed to accomplish scenario 2, which is Migrating an existing Project Server 2007 instance to an existing SharePoint Server 2007 Farm. The following sequence explains how to accomplish the migration in a general case. Depending on your environment, some customization may be necessary but if you understand the concept, it should not be very difficult. 1. Install Project Server 2007 binaries on all Servers in the Farm. To do this you may use the guide from Microsoft available at http://technet2.microsoft.com/Office/en-us/library/888fc300-edb4-43fe-86a9-5663bcd03bce1033.mspx (NOTE: Stop the process when you reach the session “Provision the Project Server 2007 site on the farm”. We will continue this step later on item 4). 2. Backup the original Databases from Project Server. 3. Restore the Databases to the SQL Server that hosts the SharePoint Farm. 4. Provision the Project Server 2007 site on the farm. a. Now is time to resume the steps remaining on step 1, but now using the restored databases from the migrated Project Server 2007. This process is not synchronous so it may take a little while to complete. Once all four steps are completed, you will have a replica of the original PWA Instance ready to use. As SharePoint does the “Load balancing” automatically there is no additional configuration to do. We hope this article can help you to understand better how Project Server can be migrated between Farms and gives you a new alternative for future deployments. Pretty sneaky, but still an excellent question! What this person essentially needed to know was how to add a buffer to a task. The goal is to allow the work on a critical task to slip for a short period of time without impacting any of its successor tasks. Of course once the buffer is used up, then subsequent tasks in the schedule may be impacted. Fortunately, I’ve come across this one before so I had an answer ready. If you need to add task or project buffers to your schedule, read on! To describe how to add a buffer, I’ll use a simple example of adding a task buffer although the same technique can be used to add a buffer to a project. For the task in need of a buffer, a new task will be inserted which will represent the buffer. It is probably a good idea to insert this buffer task right after the detail task so that we can easily keep our eye on it. This buffer task should have the same predecessor and successor relationships as the detail task. In addition, the buffer task will have a Finish to Finish (FF) relationship with the detail task. Now, I need to add the buffer for my Code Module task. I will insert a new task below my Code Module activity called Code Module Buffer. I will also create the links as described above. We need to have the predecessor relationship in place so that if the Design Module task slips, both the Code Module activity and its associated buffer will adjust accordingly. Having the Finish-to-Finish relationship in place between the detail task and the buffer task ensures that once our buffer is used up, our subsequent Start and Finish dates for successor tasks will adjust accordingly. This last part also requires that the successor relationships for the Code Module activity apply to the buffer task as well. After I change my duration for the buffer task, you can see my Finish date for that task has pushed out by 5 days. I now have my 5 day buffer! In addition, my dependent tasks have also adjusted to accommodate the buffer. The convenient Change Highlighting feature of MS Project 2007 (isn’t it great!?) shows that the only thing impacted by this slippage is the Finish date of the Code Module activity. Because we have our built-in buffer, the scheduled dates for the subsequent activities have not been impacted. Yet. That’s right! Because we used up our buffer, and then some, the Start and Finish dates for our successor tasks have shifted. In this basic example, all of our tasks are on the critical path, so our project finish date has also been delayed. There is one more important question to ask regarding managing our buffer. That is, what happens if the resource completes the work without using up the buffer? Because we have built this buffer into our schedule, the Start of any successor tasks is now unnecessarily delayed. This one will require some active schedule management on your part but the solution is still pretty easy! Once the task is complete, you can “close the buffer” by simply setting the Duration for the buffer task equal to the Actual Duration of the detail task and then marking it as 100% complete. Good news! Our Test Module activity can now begin earlier than originally scheduled because we didn’t use our entire buffer. Again, because all of our tasks are on the critical path we are now on track to finish our project earlier than planned. Our stakeholders will definitely be happy! You most likely know that using the Filter or Grouping options is one way to format your Gantt Chart. Another option is to leverage the out of the box ‘Text Styles’ formatting. For example, let us look at all tasks on the critical path. 4. Choose the color and font style for the selected tasks and click OK.
Now, all the rows that are ‘critical’ (thus on the critical path) have been formatted with your selection. Example: Format the Text Styles with Red, Italics font and see the outcome. Now you may be asking…what happens if the critical path changes? Microsoft Project will automatically change the formatting for the critical path. Thus, as the project is progressing and if the critical path changes the formatting of those tasks will automatically change too. This is a time-saver. In the project planning phase, you can use the Format -Text Styles option together with the Network Diagram to confirm you are seeing the expected results. In the execution phase, you can use this option to see the direct changes to the critical path and overall project – and take corrective action if necessary. You can do the same formatting for the Highlight filter (and even change the color of the highlight filter). We hope this quick tip helps. Many Project Managers are very good at creating a solid WBS-based project plan with estimates and dependencies. However, these project plans often get put ‘in the drawer’ while the project is being executed, never to be seen again. Why? Because many project managers are intimidated by Microsoft Project, and once the project is in the throes of execution, they feel that the project plan is just too much work to maintain. There are of course many dangers in this scenario: without good project tracking, it is almost impossible to tell whether the project is really on track, and often it becomes too late to fix the situation once the project becomes derailed. If your organization is in this situation, I recommend starting out simple with a Project Tracking process that is based on managing milestones. The setup and the process is described below. In a future blog, I’ll discuss two ways you can report on these milestones across projects. In order to do Milestone Management, it is important to standardize a set of milestones across all your projects. I recommend tracking no more than 10 milestones. Ideally, a milestone would be tied to one of two things: either each of your major project deliverables (e.g. Design Document Finalized, System Test Plans Complete, etc. ), or the end of each of your lifecycle stages (Analysis Complete, Design Complete, etc.). If you don’t have a common set of milestones, don’t underestimate the time it takes to develop and socialize this list. If you’ve been working in a decentralized mode for awhile, different groups will have their own milestones and definitions. Reconciling this long list of milestones will take some time and effort, as will the training behind the definition of each milestone and when it is applicable to the project. Once you have come up with a standard list, I recommend creating a Task Level custom field called Milestone Indicator that is set up to have a dropdown list with your list of milestones (see picture). If you are working with Project Standard, you can create this custom field in the template you commonly use, and you can instruct your Project Managers to use the Organizer (under Tools, Organizer) to move this custom field to their Desktop. If you are working with Project Server, you can create the Milestone Indicator as an enterprise field. 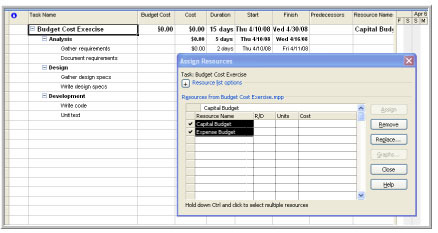 Then, create a project template and insert the Milestone Indicator into a view. Populate the Milestone Indicator for the rows where you want to denote that particular milestone. The screen capture here shows a very simple project plan that has a handful of tasks and some milestones that are cross-referenced to the ‘standard’ milestone via the Milestone Indicator. You may also want to use some color coding (using Text Styles) to call those rows out, so that project managers don’t delete those rows. Then, once you are done, you can make this template available to your Project Managers to use for their project plan development. Instruct your Project Managers to pay special attention to the milestone dates and make sure they are always up to date, and reflect the current reality. Also have them baseline their project plans so that you can use the various views within MS Project (such as Tracking Gantt) to specifically view the baseline against the current date for each of those milestones. This approach will allow your Project Managers to focus on a key set of important criteria as well as common terminology which will make the tracking process much simpler. Of course they will need to keep their plans up to date in order to keep their milestone dates current – that is the idea, of course! As I mentioned, in a future blog, I’ll talk more about how to view and track these milestones across projects once you have set up the process to track them. (1) Task 1 is 10 days in duration. (2) Task 2 links to Task 1 (it's own length is irrelevant). (3) You want Task 2 to start after 40% of Task 1 is completed. Of course, that's the cool part -- that you don't know how long it will take Task 1 to actually run, AND you don't know specifically how far from either end you really want it, you can use the format below (for instance, you can have Task 2 start 2 days before Task 1 is finished, regardless of how long Task 1 takes, by saying 1FS-2d). Well, you can specify the above relationship as: 1SS+40% (if the spirit of the relationship dictates the start from the Task 1 starting point) -or- 1FS-60% (if the spirit of the relationship dictates starting from the end point). In THIS case, using RELATIVE progress link lags, the two statements can be considered equivalent (NOT so for absolute SS or FS relationships specified in time units, of course). A hosted deployment is fast, reliable, offers flexibility and scalability and provides immediate business value. Hosting is used by many different types of customers of all different sizes and across varying industries. Referenceable companies currently taking advantage of hosted deployments, range from Fortune 500 to government and small to mid-sized businesses. Microsoft themselves utilize a hosted deployment of Project Server. Hosting is a deployment option worth exploring for implementing Microsoft Office Project Server (EPM) and Microsoft Office Project Portfolio Server (PPS). A hosted deployment of Microsoft Office Project Server or Microsoft’s newly acquired Project Portfolio Server is a reliable way to deploy one of these applications in a matter of weeks as opposed to months. A hosted deployment allows an organization to realize business advantages sooner than with a traditional deployment. Consulting hours are reduced by eliminating application installation, installation validation and installation issue troubleshooting tasks. In addition to a faster time to deployment, with hosted implementations, the data center is on an Internet backbone and typically users experience very positive application performance, even when connecting remotely. When hosting your application you are able to leverage industry best practices in the areas of integrating, upgrading, tuning and maintaining your application. Resources monitoring and maintaining your application are skilled in SQL Server, Project and Project Portfolio Server, SharePoint, Terminal Services, Active Directory, OLAP, Active X and Office Web Components. Many hosting companies maintain industry-leading uptime through redundant CPUs, drives and hot spare servers. Project Solutions Group works closely with Microsoft and our hosting partners to ensure customers receive timely 24x7 application support. Hosting provides flexible, scalable solutions that grow with your organization. The EPM and PPS specific data center infrastructures are scalable. Customers have the flexibility to migrate to their own data center at any time. You can start small and then grow your deployment on your timeline. The hosted model is one that works great for deploying an initial pilot or proof of concept. When ready, you can migrate your hosted server behind your firewall as your capacity or other business needs require it. This capability allows divisions of large businesses that need to get started with EPM quickly to do so. To support distributed, larger global deployments hosted instances are available in multiple languages. Hosting makes managing projects requiring direct customer or vendor collaboration even easier. With hosting you can allow customers, vendors, and partners to access and update project information without letting them inside your corporate firewall. Hosting is an affordable option with flexible payment terms. Often hosted contracts are offered on a month-to-month and pay by user basis. Microsoft licenses can be purchased upfront or rented depending on what best suits your business model. Hosting offers a way to simplify increasingly complex, costly, high-maintenance internal IT environments. With a hosted deployment, there is no need to invest in on-site IT infrastructure or added capital expenditures to house your application. There is no need to recruit, hire or train additional IT staff and software specialists. Existing IT staff can focus on more strategic efforts as opposed to day-to-day support activities. Hosting provides a faster Return on Investment than traditional on-site deployments. Microsoft Project Server 2007 is the first major release of Microsoft Project Server in several years. Project Solutions Group was chosen as a Beta partner for P2007 and we are happy to announce that there are significant improvements in the applications features and performance. The newest version of Project Server interface is extremely user friendly and intuitive. Layouts are easier to read and functions are easy to find and execute. Users will find that in the 2007 version, Project Server’s functionality allows them be more productive while using more advanced capabilities within the application. Project Server 2007 allows for more custom configuration allowing your business to better meet their reporting and business intelligence needs. Reports are more detailed and are easier to develop; providing more detailed data to help you manage your business. In addition, because 2007 has improved programmability on the back-end, it allows for better integration with other line of business systems. With all of improvements inherent in Project Server 2007, your company can see a generous cost savings in their day to day business. How? Server-based calculations also reduce traffic, bandwidth, and network costs between the server and desktop users and it improves performance for the end-user.. Additionally, overall administration and maintenance costs are greatly reduced. Scalability to any size enterprise is integrated and consistent with the largest SharePoint server farms, reducing management costs and allowing for better centralized management and efficient use of infrastructures. Improved error messages and reporting for debugging and maintenance help reduce technical maintenance costs and increase the effectiveness of the support team. Administrative functions are more clearly organized, grouped, and more powerful, improving the productivity and responsiveness of application administrators and reducing training and maintenance costs. PSG is currently running a webcast series on Microsoft Project 2007 including a live demonstration of the software. To find out dates and times, please visit our website at www.psgus.com/events.